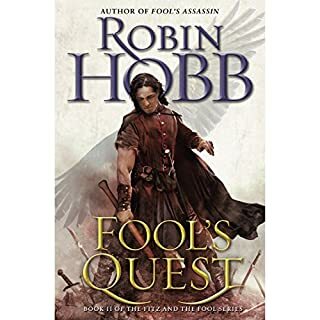 What was one of the most memorable moments of Fool's Quest? I really liked it when Chade winked at Fitz while acting like a senile person. 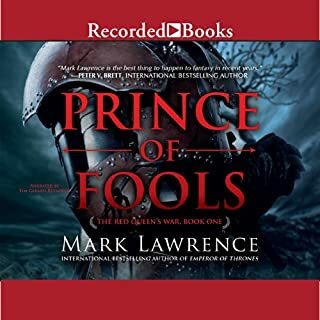 The narrator's choice of accent for the Fool was unfortunate. I also wanted to kick Dutiful in the teeth every time he spoke because he sounds like a spoiled, arrogant muppet of a monarch and it really just drove me insane. I just don't understand why narrators feel the need to "show us they're real actors" or something and go all crazy with the accents. Are there directors for book readings? Maybe there should be. Despite all of that, I did not think the narration rendered the book unlistenable. Still worthwhile, imho. I continue to find Fitz's slow uptake on the nature of his own daughter to be a little ridiculous and unbelievable. I'm going to need the story to reveal that he's been the target of a Skilling to make that part ok. I don't think these two novels in this trilogy are quite as good as the earlier trilogies, but I think that's to be expected. I think there are perhaps too many sappy emotional moments, but that didn't bother me because I like that kind of stuff more than I like to admit. Ewzad Vriil's keep has fallen and Justan has been reunited with his friends. Justan's bonds with Fist and Gwyrtha have made him stronger and faster, but the more he learns about his powers, the more questions he has. Meanwhile, the kingdom remains in turmoil. The mother of the moonrats still builds the Dark Prophet's army of monsters in the mountains, and the Battle Academy forces are weakened. New narrator nearly kills it for me. I'd definitely recommend for young adult readers. What didn’t you like about Andrew Tell’s performance? 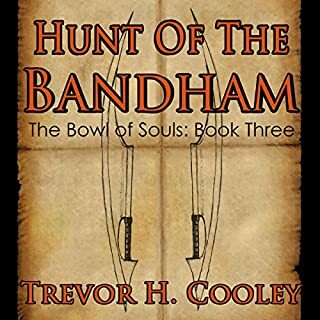 The narration wasn't awful, but it really bothered me that the narrator placed strange emphasis on the last word in a sentence or other equally inappropriate and bewildering places. The awkward syncopation and intonation really drove me crazy. It didn't seem to bother other people, so I must just be really picky about it. 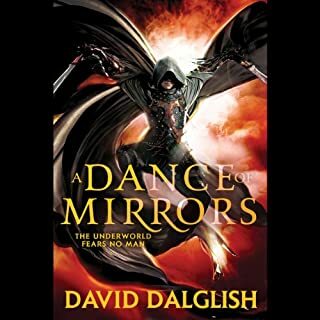 But it bothered me so much that within ten minutes of beginning to listen to the book I went to check if the narrator had changed since book two. I tried finishing the Audible version, but ended up just reading the text version on my Kindle. This was so good it makes me want to listen to the Prince of Thorns novels again. Narration was excellent. How much must one pay for an hour of youthful folly? The Pureblood Registry accused Lucian de Remeni-Masson of "unseemly involvement with ordinaries", which meant only that he spoke with a young woman not of his own kind, allowed her to see his face unmasked, worked a bit of magic for her.... After that one mistake, Lucian’s grandsire excised half his magic and savage Harrowers massacred his family. Lovely, engaging and well performed. Another great work from Carol Berg, and a laudable performance by McLeod Andrews. The story was truly engaging and developed in directions I was often surprised by. No cookie cutter effort here, although I know I scarcely need to state that about Berg. The narration was superb. I can't say I found every accent beautiful, but that would be unfair to demand in a work of this type. I merely state it to note my honest reaction. One has conquered a city. The other covets an entire nation. Haern is the King's Watcher, protector against thieves and nobles who would fill the night with blood. Yet hundreds of miles away, an assassin known as the Wraith has begun slaughtering those in power, leaving the symbol of the Watcher in mockery. When Haern travels south to confront this copycat, he finds a city ruled by the corrupt, the greedy and the dangerous. Rioters fill the streets, and the threat of war hangs over everything. Some of the accents are simply painful to hear. 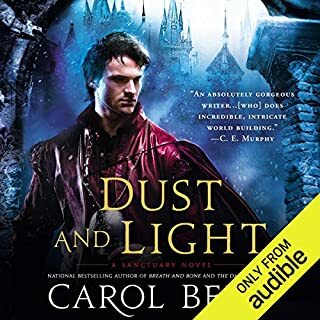 I thought I might get used to it over the course of the book, as I have iwith many other audio books, but every single time I heard certain accents I would cringe. The accents seemed almost randomly chosen with little consistency with the story. I also found the enunciation, intonation and emphasis to sound almost intentionally awkward and unnatural. I'm not sure why I bothered to listen to this book. Somehow, I recalled thinking that the earlier books were much more compelling and I don't recall being so annoyed with the narration. It's possible I've just become jaded or bored, so take my review as just one listener's opinion. I love Brandon Sanderson and recently enjoyed listening to Words of Radiance quite a lot, but felt disappointed with Warbreaker, which I enjoyed when I read (not listened) to it years ago. So maybe I'm just experiencing listening fatigue. Here are my takeaway impressions having just completed listening to the book. I didn't feel any attachment to the characters. I can't articulate precisely why, but it may have been due to my overall disappointment with the entire experience. I found the writing lazy and blunt in far too many instances--emotions and thoughts that should have been simple to convey with subtle story telling were described with absolutely no nuance. The plot didn't hang together and felt slapped together.